Hatty’s Half Hour is a new comedy podcast where Hatty Ashdown has a nice chat with some nice funny people. This summer Hatty is heading up to the Edinburgh Fringe to put on Hurry Up Hatty and speak to some great comedians with their own shows. 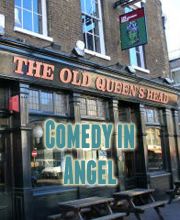 Find Laugh Out London on iTunes. Matt is a surreal story-teller who has trouble sleeping. Is a fantastic, award-winning newcomer. Beth brings her wonderfully camp and bonkers daytime television host Olive Hands to the Fringe.